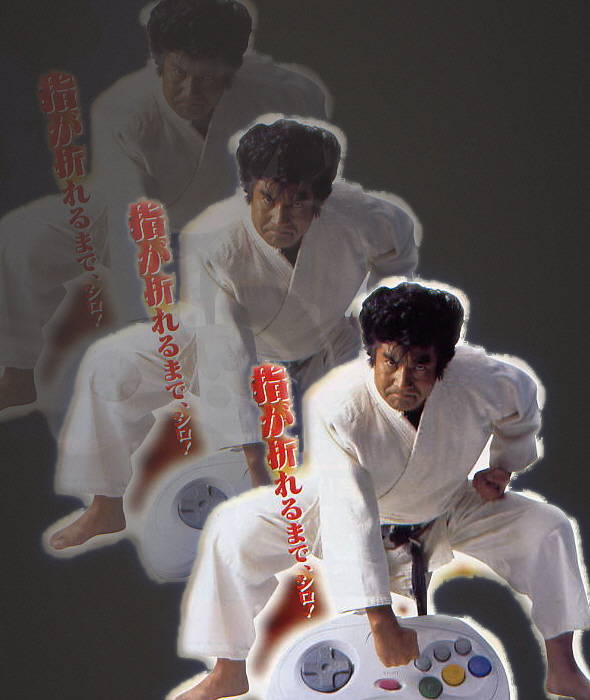 Segata Sanshiro is a fictional character created by SEGA to promote the the Sega Saturn console in Japan . Coming about in 1997 ,Segata starred in a series of adverts which ran until late 1998. 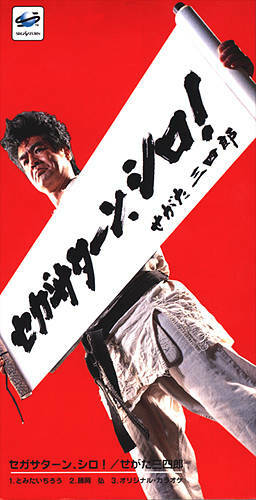 His character was based on a Akira Kurosawa character called Sanshiro Sugata who was the star character in Akira Kurosawa's directorial début , the aptly named '' Sanshiro Sugata ''. 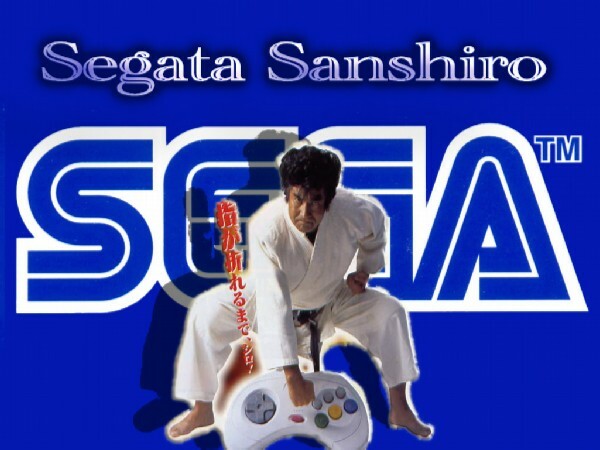 Like Sugata ,Segata is a Judo champion and revels at showing his ability, Segata lives alone and trains himself with the aid of a Giant Sega Saturn which he carries on his back ,by punching buttons and smashing things he goes about punishing the population that fail to play the Sega Saturn. Some of his signature moves are devastating,like when he throws you twice you explode. By frequenting the City he dishes out punishment to those who fail to play Saturn ,as he believes playing video games is one of life’s most treasured pastimes. Like Akira Kurosawa's legend who had a song the kids would sing . 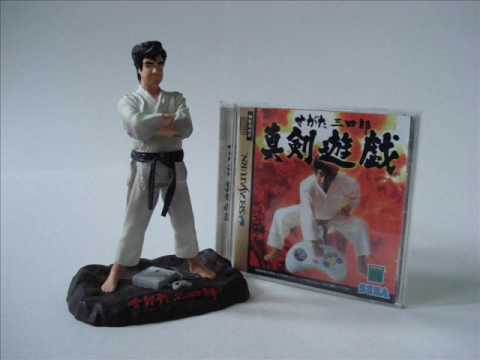 Segata also has his own theme song which when released on CD in Japan sold over a 100'000 thousand copies . The character in the commercials is played by Hiroshi Fujioka ,who became a overnight success after only being famous for playing the hero in the influential Tokusatsu superhero series 'Kamen Rider''. 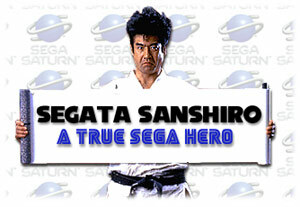 Segata got so famous that Sega even released a game with him in as a major role. 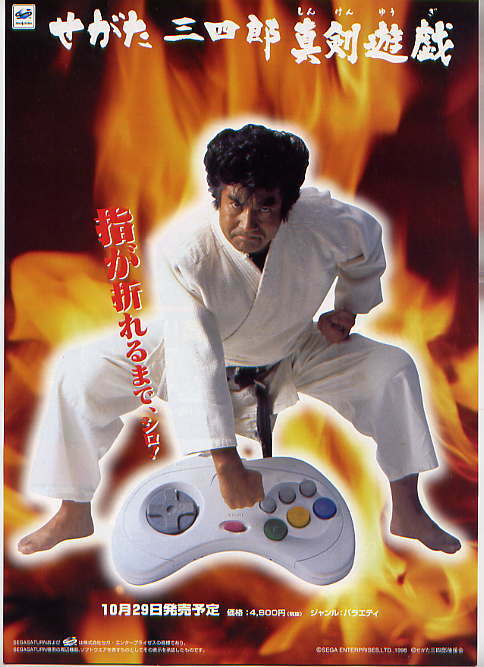 Segata was retired with the launch of the Dreamcast ,which he was present at. He is often referred to as a serious contender to Chuck Norris as the hardest man alive. A True Legend and a Hero to Gaming for sure. 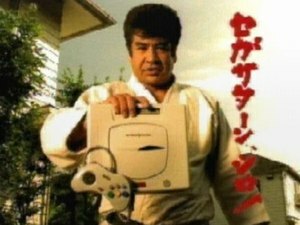 Between 1997 and 1998 Segata Sanshiro advertised the Sega Saturn on Japanese TV in a range of of beat commercials where our Hero would convince the public to buy a Sega Saturn,it must have worked ,due to the Success of the Saturn in Japan.Why O' Why did we not have campaign like this for the Saturn or Dreamcast in the Europe I'll never Know. Any Way to view the commercials click here! 100'000 copies sold proves he was a video game legend.